In addition to degree-granting schools, the NCES also lists eight colleges in New Mexico that offer less-than-two-year degrees. Schools that fall into this category are mostly comprised of technical training centers, trade schools, non-accredited business schools, and beauty colleges. Instead of degrees, most programs that fit this description culminate in career certificates or diplomas instead. Online education in New Mexico has come a long way in the last decade. 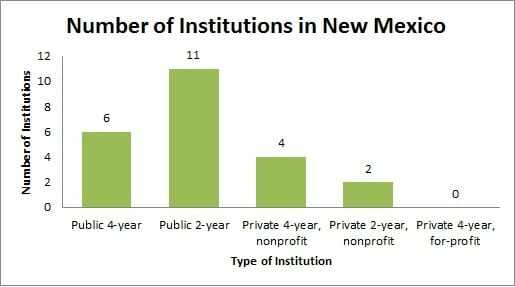 As more and more students become interested in distance learning or hybrid options, the number of colleges in New Mexico who have begun to offer them has increased. And the more schools that offer these programs, the better it is for students. With online degree programs, New Mexico students are able to earn a new degree or finish a degree they already started without having to relocate or commute. Meanwhile, thanks to online education, working adults can earn advanced degrees during evening and weekends while remaining in the workforce. And because you can earn online degrees from home with an internet connection, busy parents are also able to earn them during their spare time. While school rankings provide an excellent measure of a degree program's success, it's important to note that not all types of programs are judged in this format. Several community colleges in New Mexico offer online degrees and hybrid education options that weren't considered for these rankings. One example is Central New Mexico Community College, a school that offers a robust distance learning program for two-year students. Just like most careers in health care, the field of occupational therapy assisting in New Mexico is booming. According to U.S. Department of Labor predictions, job openings for occupational therapy assistants in New Mexico could increase by as much as 43 percent from 2012 to 2022. For a job that starts with a two-year degree, occupational therapy assisting also offers exceptionally high pay. In 2014, occupational therapy assistants in New Mexico earned a mean annual wage of $56,480. According to the BLS, occupational therapy assistants need to earn an Associate degree from an accredited occupational therapy assisting program. Students who hope to earn this degree should start by taking courses in science and human health, such as anatomy and physiology, biology, nutrition and psychology. Because of the increased use of languages other than English in the Southwestern part of the United States, job openings for interpreters and translators could surge in the coming years. Specifically, the U.S. Department of Labor predicts that employment for these workers could increase 42 percent in New Mexico from 2012 to 2022. Interpreters and translators in New Mexico also earned $42,380 in 2014, which helps with this job's popularity. Interpreters and translators can get started with a Bachelor's degree in nearly any field. However, a degree in English or a foreign language may be especially helpful. Since the main requirement for this job is absolute fluency in at least two languages, some interpreters and translators may be hired without a degree. Because of an overall demand for ultrasound technology as an alternative to more invasive procedures, jobs for diagnostic medical sonographers in New Mexico could increase by as much as 40 percent from 2012 to 2022. Meanwhile, high pay and quick entry into the workforce have also helped boost the popularity of this career choice. Even though you can generally get started in a career as a diagnostic medical sonographer after earning a two-year degree, workers in this field earned an mean annual wage of $65,580 in New Mexico in 2014. According to the BLS, most diagnostic medical sonographers earn an Associate degree in Diagnostic Medical Sonography. However, some students do opt for Bachelor's degrees instead. Workers in related fields, such as radiation therapy, can also get started in this career with some on the job training. Students looking for a fast-paced career in the hospitality industry should look no further than meeting, convention, and event planning. In this profession, workers create and design meaningful events for clients, using their own creativity and ideas to drive the process. Because of the demand in this field, job openings could be plentiful as well. According to the Bureau of Labor Statistics, employment for meeting, convention, and event planners in New Mexico could increase by as much as 40 percent from 2012 to 2022. Most meeting, convention and event planners need a bachelor's degree and some experience in the hospitality industry. While degrees in hospitality or tourism management are common, students often get started with a degree in a related field such as marketing, communications, public relations, or business. Just like many jobs in technology and computers, employment for information security analysts is expected to increase over time. U.S. employment predictions show that job openings for information security analysts could even increase by as much as 38 percent in New Mexico through 2022. Meanwhile, high wages add to the allure of this career choice. As of 2014, information security analysts earned an mean annual wage of $93,040 in New Mexico. According to the BLS, most information security analysts have a bachelor's degree in a computer or technology-related field. Common degree choices include Computer Science and Computer Programming. Some employers prefer to hire candidates who also have an advanced degree. As the BLS notes, the Masters of Business Administration in Information Systems is a common path for these workers. While pursuing any of the degrees we mentioned is no guarantee, most students are better off pursuing a targeted degree that makes sense with their desired career. Before you choose a degree program, make sure to research outcomes to ensure your degree choice could lead to an industry or career that fits your areas of interest. Another important factor to consider before choosing a school is how much it costs. Tuition can be highly irregular from school to school, and can depend a lot on factors such as location, your chosen major, and whether or not it is a private or public institution. Meanwhile, it also matters how long your degree program is expected to last. Obviously, four-year degree programs will be more expensive than two-year programs in the long run. It makes sense to run the numbers to get a full picture. Even though the cost of college has increased over the years, it doesn't mean college can't be affordable. The fact is many students in New Mexico and beyond qualify for federal and/or state financial aid. In order to determine whether you qualify, you'll likely need to fill out a Free Application for Federal Student Aid, which is commonly referred to as a FAFSA form. This form helps state and federal governments determine what type of aid you qualify for, and how much. The New Mexico Higher Education Department also lists resources on its website that can be useful for students seeking financial aid. Details on specific scholarships and grants can be found, as well as how to apply. Included is a list of New Mexico grants, loans, scholarships, and work-study programs that may be of interest. 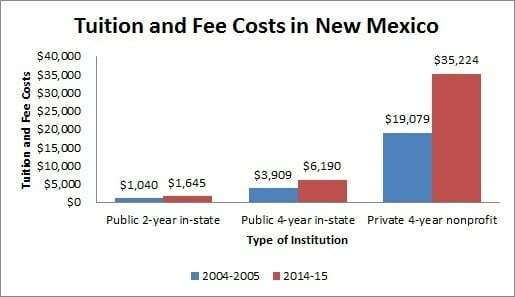 While some types of New Mexico financial aid doesn't need to be paid back, other types - including loans - will need to be repaid over time. Make sure to read the fine print on your financial aid package before accepting it.